Pegida’s slogans – “For the preservation of our culture”, “Against religious fanaticism” and “Against religious wars on German soil” – do smack of intolerance; a sectarian vision of the world. The us against them of action movies and cartoons telling our children very early on that it’s all about defeating the baddies, the catalysts of all things evil, whom the pure are perennially crusading against. This is a Manichaean approach that couldn’t be more simplistic. Pegida sympathizers’ concerns shouldn’t, however, be dismissed that easily. Such apprehensions ought to be listened to; they deserve to be answered. It’s the job of high-profile politicians to articulate eloquent, non-patronizing responses to Pegida’s supporters. To ignore them or dismiss them as extremists or ignorant simpletons would be a dreadful mistake, a faux pas that crowds are powerful enough not to let politicians forget; the latter could even be forced to step down for their lack of understanding. Or perhaps the payback would not be the loss of a parliamentary seat but the realisation that compromise will prove a lot harder. That could lead to quagmires in the style of Italian politics. A type of rigidity that can stop a whole country from advancing: short-lived governments unable to form stable coalitions are the stuff of nightmares. Even Sweden has had a taste of that recently. Alternative für Deutschland – a sort of slightly milder German version of Ukip – is just waiting for that to happen. As seen from the outside, it looks as if the southern part of eastern Germany (Dresden, Leipzig and the nearby areas well south of Berlin) are not used to the levels of immigration other parts of the federal republic have witnessed. The proportion of foreigners is 2.2 per cent in Saxony; the national average lies at 8.2 per cent. Intercultural modes of living together in the same communities perhaps haven’t yet had the time to develop – and this is perhaps affecting ordinary people who’d otherwise be less anxious in other aspects of life. If such a hypothesis is correct, these people shouldn’t be stigmatized for the lack of cultural exposure they are yet to experience. In fact, the German Federal Minister of the Interior Thomas de Maizière correctly pointed out that among the participants of the mass rallies were ordinary people who expressed their disbelief in the way mainstream politics is facing up to the challenges of today’s society. Mass immigration is not a new phenomenon in Germany as a whole. But whilst central governments once encouraged it – the Gastarbeiter, theimmigrant workers to West Germany of the 60s and 70s came in handy in rebuilding the German powerhouse a bit more cheaply, which then allowed the country to pay back its WWII debt earlier –, now the masses are a tidal wave that’s perceived as un unchecked Mediterranean tsunami. It all brings to mind Ralph Giordano. This is because the German author with Italian Jewish ancestry has recently passed away and is therefore still fresh in the mind. Having suffered discrimination himself – he was born in Hamburg in 1923 – he was always very careful and sensitive in his writings with regard to ethnicity and migration issues. Giordano suddenly hit the headlines a few years ago. He claimed that Cologne’s first large mosque – and there were thirty-three of them in the Rhine river metropolis at that time, mostly inconspicuously hidden away in the city’s nooks and crannies – shouldn’t be built. Coming from him, a tolerant, sensible and internationalist mind who suffered greatly at the hands of the Nazis, it struck many as remarkable. In an interview in The New York Times in 2007 Giordano depicted German mosques as representing “a symbol of a parallel society”, and called the integration of German Muslims “a failure”. Perhaps Pegida is in a clumsy way of bringing back Giordano’s worries with reason. Their call shouldn’t be left unheard and end up being harnessed by the unscrupulous meddling of extra-parliamentarian forces who believe in the persuasiveness of intolerance. Alessio Colonnelli holds a combined B.A./M.A. in modern foreign languages and literary translation from Padua University, Italy. Alongside his academic studies he has worked in Madrid and Barcelona, Spain, and as an international press editor for a well-known media intelligence company in London, UK, translating from German, Italian and Spanish into English. 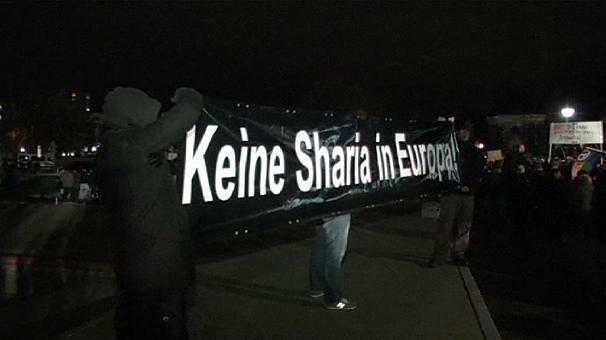 This entry was posted in Germany and tagged European identity, immigration, Islam, Pegida. Bookmark the permalink.